Families planning a vacation to Washington D.C. often forget that where you stay can be as historic and fun as where you visit during the day. Did you know you can sleep over in one of D.C.’s historic buildings? 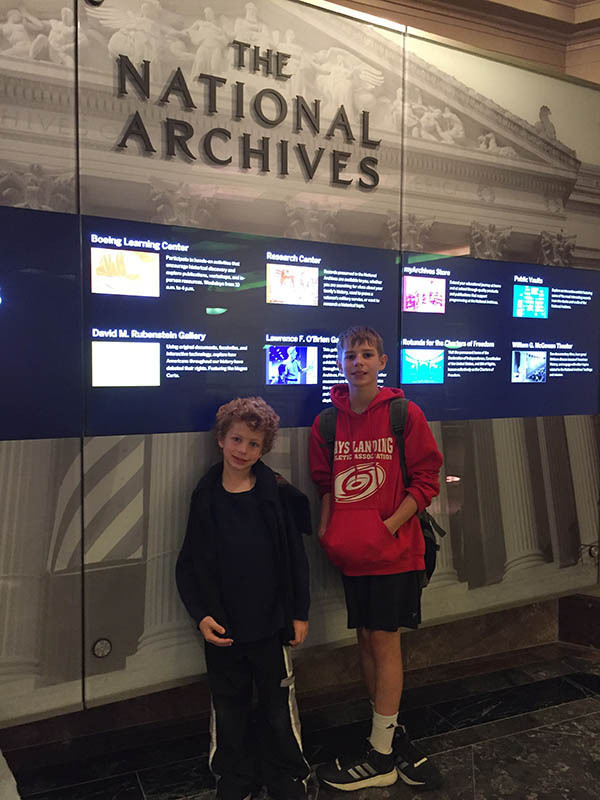 One TravelingMom participated in a recent National Archives sleepover with two boys and is sharing the details on the historic fun they all had. What amazing opportunities our kids have! 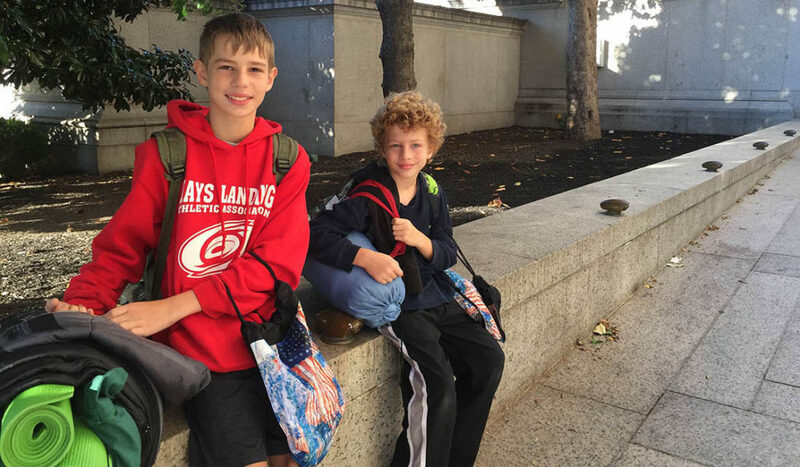 I remember having some great field trips as a kid, but I don’t remember anything as epic as a sleepover in an historic building, such as the National Archives in Washington D.C. Just look at the fantastic time we had at History, Heroes, & Treasures. I’m always up for a new adventure with my boys. When the press release for History, Heroes, & Treasures, the National Archives overnight program, arrived in my inbox, I knew I needed to learn more. I wasted no time reaching out to the National Archives Foundation to get more information. I was elated when they invited my boys and me to attend their sleepover on October 22-23, 2016. Without hesitation, I registered myself and 2 of my 3 sons. My 8-year old and 12-year old joined me on this overnight. Unfortunately, my 10-year old couldn’t come due to a soccer conflict. 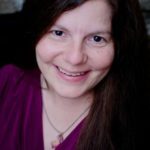 TravelingMom Tip: Call as soon as possible! Their sleepovers sell out quickly. The National Archives Foundation recommends packing light as there is not a lot of storage space for luggage and backpacks. 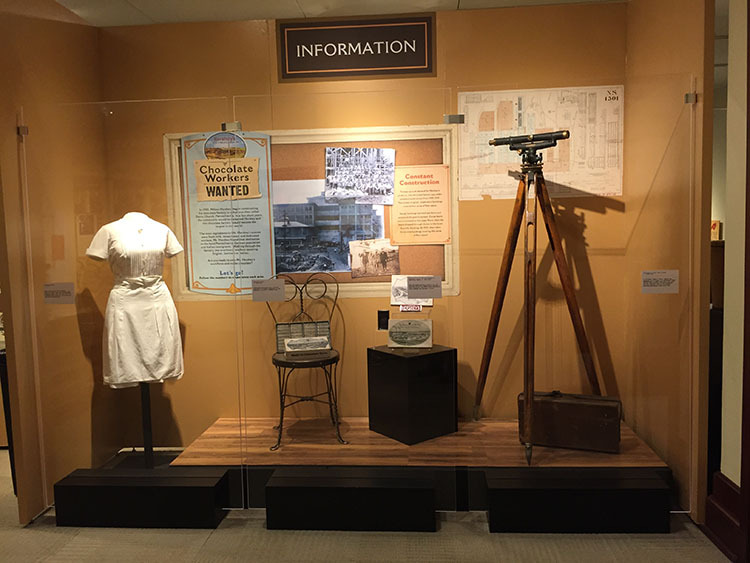 Consider too that you will likely be walking with your luggage from either a parking garage or train station, as the National Archives does not have their own parking garage. See their suggested list of items to pack. We rolled our pillows inside our sleeping bags. Inside our rolled-up pillows were our yoga mats that served as a buffer between the marble of the National Archives Rotunda floor and our sleeping bags. My sons wore sweatpants and I wore yoga pants. Clothes like this were comfortable to sleep in yet still functional for the activities. Keep in mind several children and adults will be getting ready for bed at the same time and waking up at the same time the next morning. While there are plenty of bathrooms, there’s only so many people who can change at one time. National Archives sleepovers typically start between 6:30 and 7 pm. To ensure I wouldn’t be driving around searching for parking, I prepaid for a parking space using an app. I also arrived early to beat traffic and allow time for dinner. Dinner will not be served during the sleepover, so make sure you eat before you arrive. We visited the United States Navy Memorial museum first. Then, after the museum closed for the night, we had dinner at a nearby restaurant before heading for the National Archives. Here’s some other ideas from Traveling Moms about Washington D.C. attractions to visit with kids. 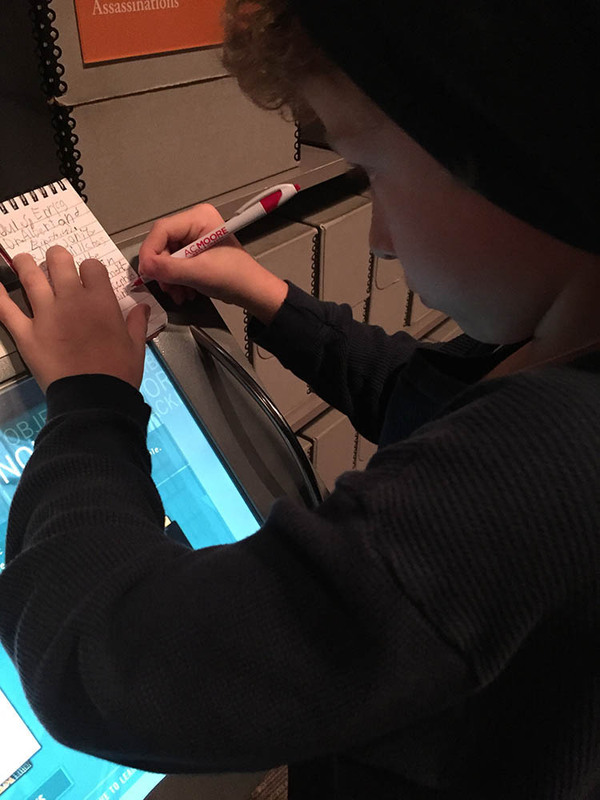 Read about Nancy’s visit to Washington D.C.’s The Spy Museum. 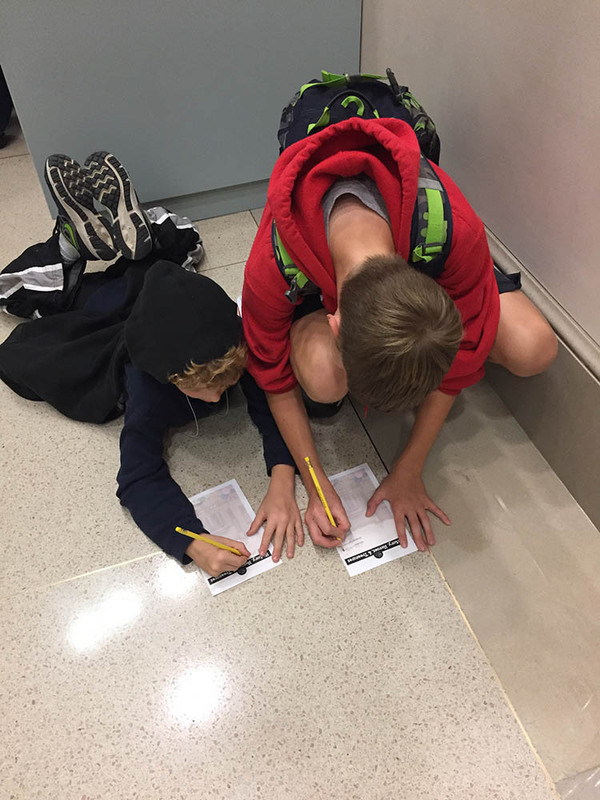 Renee wrote about a family friendly self-guided walking tour of Washington D.C.
Nancy also took her kids to the Newseum in Washington D.C.
Check-in for our National Archives sleepover was smooth and orderly. I was very impressed with how organized everything flowed. We were greeted as we signed in at the check-in desk. A photographer took our “before” pictures at a photo booth. Downstairs, staff tagged our bags and kept them safe until later that evening. Then we had free time to explore the National Archives until orientation. There was no getting bored at this sleepover. The National Archives team kept my boys and me engaged in activities from orientation to bedtime a few hours later and then again the next morning. 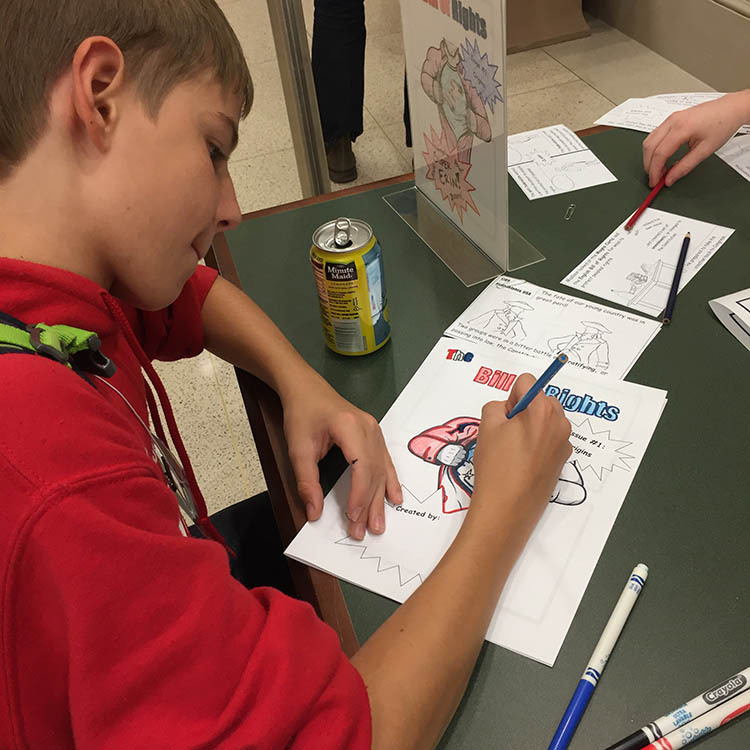 Save the Day: Activity Stations had my boys connecting activities they love – board games, comic books, and writing – with lessons about history. What a fun way to learn! My 8-year old even wrote a letter to then-president, Barack Obama. You can learn more about those activity stations here. After snack time, we met Sojourner Truth, Elizabeth Cady Stanton, John Dunlap during an Interview Our Heroes session. As bedtime approached, children could choose between listening to a story in one area or watching a movie in the McGowan theater. My boys chose to watch the Peanuts movie about colonial times and the beginning of our government. It’s lights out at 11 p.m. Kids can opt out of the story time and movie and start getting ready for bed at 10:15 p.m. Having bedtime slightly staggered meant we didn’t have to wait too long for our turn to wash up and brush our teeth. The rotunda where we all would sleep provided plenty of room for everyone to stretch out their sleeping bags. And yes, we all slept within steps of the Declaration of Independence, so cool. 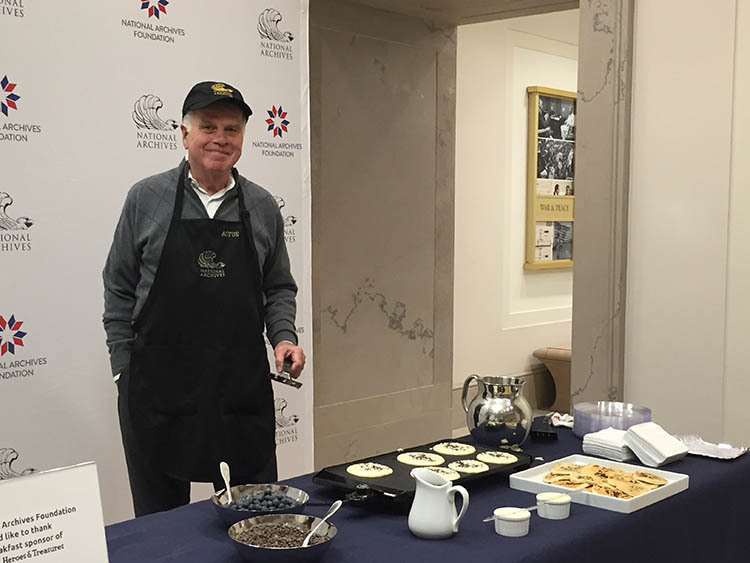 The National Archives team knows how to wake kids up right. At 7 a.m., music filled the air. Aretha Franklin’s Respect played and we knew the song my boys had voted for as the best wake up song had won. We excitedly got ourselves cleaned up and ready for a catered chocolate chip pancake breakfast. 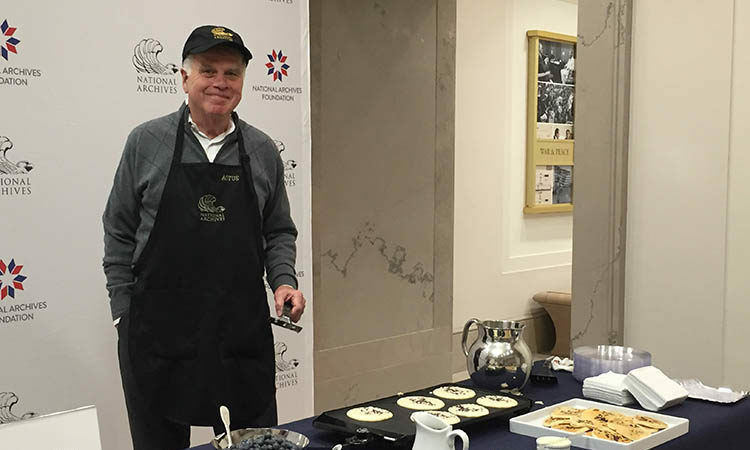 With our bellies full of pancakes, muffins, and fruit, we took full advantage of the remaining activities before we had to say goodbye to the National Archives. We sipped on hot chocolate like it used to be made in colonial times. It’s not as sweet as today’s hot chocolate with marshmallows and whipped cream. My boys and the new friends they met the night before took time to explore one more exhibit. Then, it was off to the Soaring Superheroes Team challenge, where our team lost by just 3 points. And of course, we shopped for souvenirs. Leaving the National Archives sleepover was hard. We could have stayed all day. My boys enjoyed the exhibits immensely and would have loved to explore more. 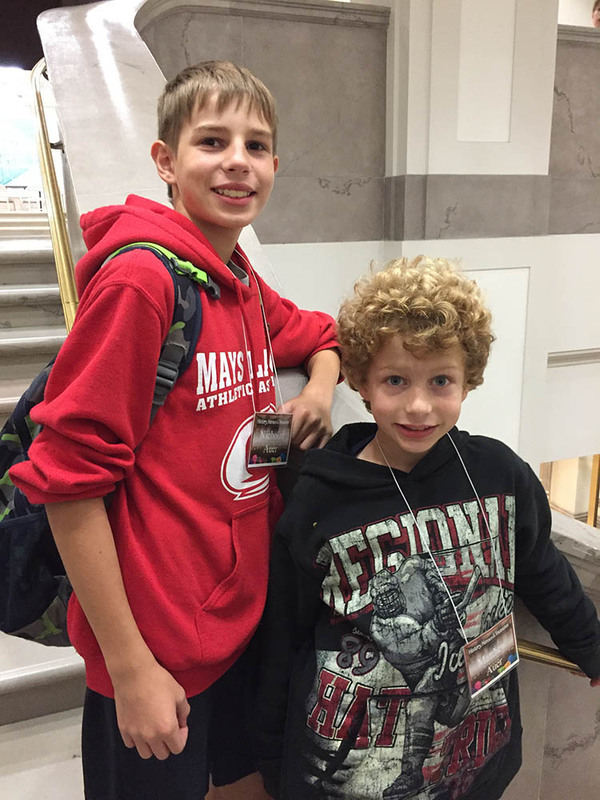 The sleepover was a great way to get introduced to the National Archives and I know my boys want to go back. As we left, the team was just as pleasant as the night before. The photographer was even on hand to take an “after” picture. My boys were thrilled to be gifted swag bags with souvenirs. There were bags for parents as well. Between our pictures and souvenirs, I know we’ll be remembering this super slumber party for a long time. National archives sleepovers happen once or twice a year. You can learn more at their site, https://www.archivesfoundation.org/sleepover. What a great tip! Sorry my kids grew up without doing this. Perhaps I can take some grandchildren. Thank you.